Washington D.C., Mar 23, 2019 / 04:17 am (CNA).- As multiple states consider assisted suicide legislation, disability activists are speaking out, saying the bills are slippery slopes that put the lives of people with disabilities at risk. Connecticut lawmakers are now considering HB 5898, “An Act Concerning Aid In Dying For Terminally Ill Patients,” which would permit doctors to prescribe lethal medication to people with less than six months to live. The patient would be permitted to self-administer the medication when they wish to end their life. HB 5898 is modeled after Oregon’s assisted suicide law, which was the first in the nation. On Monday, members of the state General Assembly’s Public Health Committee heard testimony from those who are in favor of the bill, and from those who are opposed. Cathy Ludlum, one of the leaders of the group Second Thoughts Connecticut and a woman who lives with a disability, provided written testimony that was emailed to all members of the public health committee. In the testimony, which was forwarded to CNA by Second Thoughts Connecticut, Ludlum explained that the language of the bill puts people with disabilities at risk. Ludlum said the definitions in the bill mean that she herself would be defined as someone who is terminally ill, even though she is not. “Nowhere does it say ‘with or without treatment,’” Ludlum pointed out. “Most people assume this legislation is for people who have exhausted all their treatment options, but that is not what it says.” Ludlum explained that she eats with a feeding tube and requires respiratory support when she sleeps. Ludlum is also concerned that the law would enable doctors to steer patients with disabilities into ending their own lives, or stopping treatment needlessly. She noted that due to the language of the bill, which states that the lethal medication “may” be self-administered, as opposed to that it “shall be” self-administered, there would be nothing to prevent someone else from ending the patient’s life. He believes that assisted suicide laws are rooted in discrimination, because people are afraid of what life would be like with a disability. “Nobody wants to have a broken neck. Everybody says they’d rather be dead,” said Weisman. Weisman told CNA that he would like to see expanded access to palliative care for those who are in pain, as well as increased education for people in the medical field about how it is possible to live a meaningful life with a disability. Elsewhere in the country, 16 other states are in the process of passing similar legislation, including Maryland and Nevada. Members of Maryland’s Senate Judicial Proceedings Committee approved the “End-of-Life Option Act” on Friday. The bill had advanced through the state House of Delegates earlier in March. In Nevada, the state Senate is considering SB 165, which would allow doctors to prescribe lethal doses of medication to terminally ill patients over the age of 18. The bill has passed through one working session of the Senate Health and Human Services Committee. Hartford, Conn., Sep 18, 2018 / 11:07 am (CNA/EWTN News).- Father Juan Miguel Betancourt Torres, a member of the Institute of the Servants of the Holy Eucharist and the Blessed Virgin Mary, was appointed auxiliary bishop of Hartford on Tuesday. “For the laity of the archdiocese in all its present-day diversity, Fr. Betancourt’s Hispanic/Latino heritage will only enhance the pastoral care that he will exercise for the good of everyone of every race and ethnicity,” he said. Fr. Betancourt was born in Ponce, Puerto Rico in 1970. He entered the Institute of the Servants of the Eucharist and the Virgin Mary, a contemplative community which is part of the Schoenstatt Movement and which was founded in Puerto Rico, as a postulant in 1992. He professed vows as a religious in 1994, studied at the Pontifical Catholic University of Puerto Rico, and made perpetual vows in 2000. He was ordained a priest of the religious institute in 2001, and received a licentiate in scripture from the Pontifical Biblical Institute in 2005. After receiving his licentiate Fr. Betancourt taught scripture at the Pontifical University of Puerto Rico and Regina Cleri Major Seminary, before beginning work in the Archdiocese of Saint Paul and Minneapolis in 2006. Since then, he has been a professor of sacred scripture at the Seminary of Saint Paul and the University of St. Thomas, local superior at the Casa de San José, and pastor of St. James and St. Francis de Sales parish. Fr. Betancourt currently serves as vice rector and associate academic dean at St. Paul Seminary, in addition to teaching. He is also vicar general of the Society of the Servants of the Eucharist and Mary. He has served on the Saint Paul-Minneapolis archdiocese’s presbyteral council, and is a board member of the National Conference for Seminarians in Hispanic Ministry. Fr. Betancourt will be consecrated a bishop Oct. 18 at the Cathedral of St. Joseph in Hartford. Austin, Texas, Mar 7, 2019 / 04:52 pm (CNA).- The Dominican Sisters of Mary, Mother of the Eucharist had a problem. They were running out of room at their convent in Ann Arbor, Michigan, where they had been based since 1997. It was a good problem to have, the result of a boom in young vocations. But it meant that the community of 140 sisters needed to expand. With property in both California and Texas, the sisters prayerfully considered both options, ultimately deciding that God was calling them to open a new convent in the Georgetown, Texas. Twenty-five miles north of Austin, Georgetown is in the Hill Country of the Lone Star State. The sisters’ presence in Texas reaches back to 2009, when eight sisters came to teach in the Diocese of Austin, invited by then-Bishop of Austin Gregory Aymond. Members of the community currently teach in four Catholic schools in Texas. “As our presence has steadily grown, our apostolate has flourished, enabling us to expand the work to which God has called us – to praise, to bless, and to preach through catechesis, evangelization, and witness,” the sisters said in a statement. In 2012, the Dominican Sisters of Mary, Mother of the Eucharist began a $30 million capital campaign to fund the first phase of a new Religious House. That phase was recently completed and is comprised of living space for 56 sisters, along with dining space, a gymnasium and library, and areas for education and community. Twelve sisters have moved in so far, the Dallas News reports. The building was blessed in a Feb. 16 ceremony. Bishop Earl Boyea of Lansing, head of the diocese where the sisters are from, presided over the ceremony. 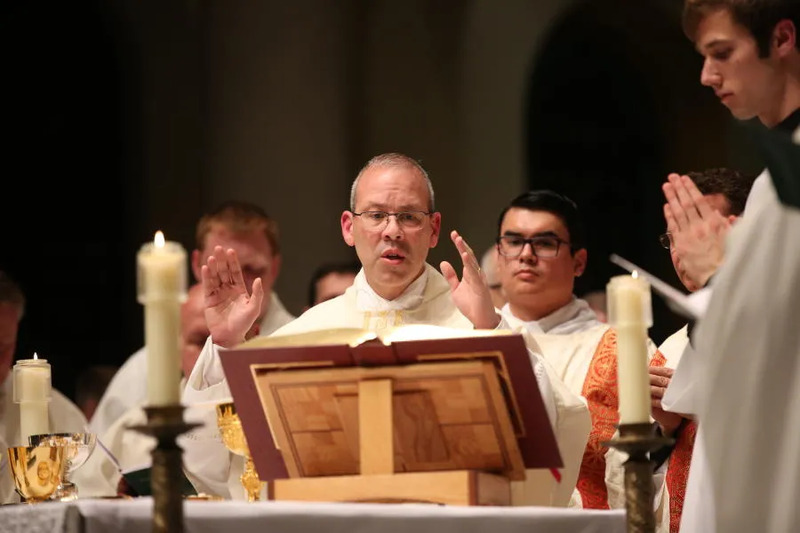 He was joined by bishops from around the state of Texas: Bishops Joe Vasquez of Austin, Michael Mulvey of Corpus Christi, Joseph Strickland of Tyler, Brendan Cahill of Victoria, and Stephen Lopes of the Personal Ordinariate of the Chair of St. Peter. “As patroness of the Americas, Our Lady of Guadalupe holds a special place in the heart of our own community as well,” the sisters explained in their statement. The Texas convent marks the community’s first expansion beyond the Motherhouse since 1997, with more expansion projects planned. “Never in our wildest imagination, did we ever think about being in Texas when we first started,” said Mother Assumpta Long in an interview in the Dallas News. I recently suffered sudden blindness/low vision which I have been coping with for almost one year. I learned from various lay persons who reached out to me from my local Dominican parish about “redemptive suffering.” I began to offer up my situation to God to use to bring about greater good and the Kingdom of God. Never have I received so many graces and blessings as I have through this suffering. 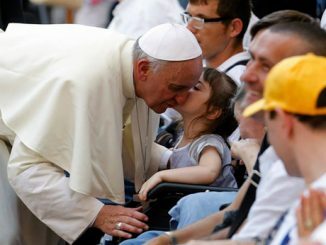 More needs to explained on this issue of redemptive suffering to remove the fear of a person with a disability.